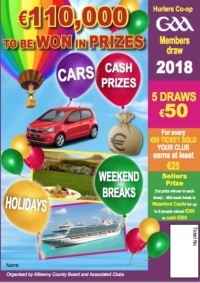 The results for the first Hurlers Co-op Draw for 2018 are in and the 1st prize goes to Marie McDonald, Ballinlough, Carrigeen Club. The second draw will be held on Tuesday June 26th. Click below for a full list of prizes winners. The Hurlers Co-op draw was launched at the April meeting of the County Board by former Kilkenny Hurler Eddie Keher. The draw which is entering its thirty seventh year provides all Clubs and the County Board with a valuable income stream year-on-year. This year the prize fund is almost €110,000 which will be returned to support the facilities and development programs within the county. The cost per ticket is €50 which equates to €10 per draw, this provides excellent value for money to the customer. Over the past ten years a total of €4.5million has been gathered in income, over half has been returned to clubs. Please ensure your club has a plan in place to sell the Hurlers Co-op draw tickets, ensuring a maximum return with no risk to the club, over the next few weeks. The Final Draw in this Years Hurlers Co-Op took place last evening in Piltown. Click on Read More below for all the winners. Kilkenny GAA sincerely thanks all those who supported and promoted the Draw again in 2017. The penultimate draw took place in Piltown last evening. Congratulations to all the winners. Click on Read More below for all the details plus a selection of photos, courtesy Jimmy Walsh. The occasion coincided with birthday celebrations for Bill Norris and Gerri Hickey. The Final Draw takes place on Tuesday 8th August. 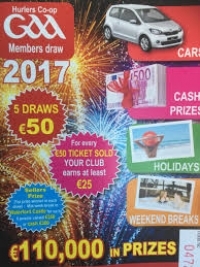 Draw No 3 of this year's draw took place last evening in Piltown. Kilkenny GAA would again like to thank all those who supported the draw in any way.